Financial support of our research from MINECO (grant CTQ2015-68380-R) and CAM (B2017/BMD-3813) is gratefully acknowledged. Pyrrole is one of the most important one-ring heterocycles because of its widespread presence in natural products and unnatural bioactive compounds and drugs in clinical use. The preparation of pyrroles by reaction between primary amines, β-dicarbonyl compounds, and α-halo ketones, known as the Hantzsch pyrrole synthesis, is reviewed here for the first time. In spite of its age and its named reaction status, this method has received little attention in the literature. Recent work involving the use of non-conventional conditions has rejuvenated this classical reaction and this is emphasized in this review. 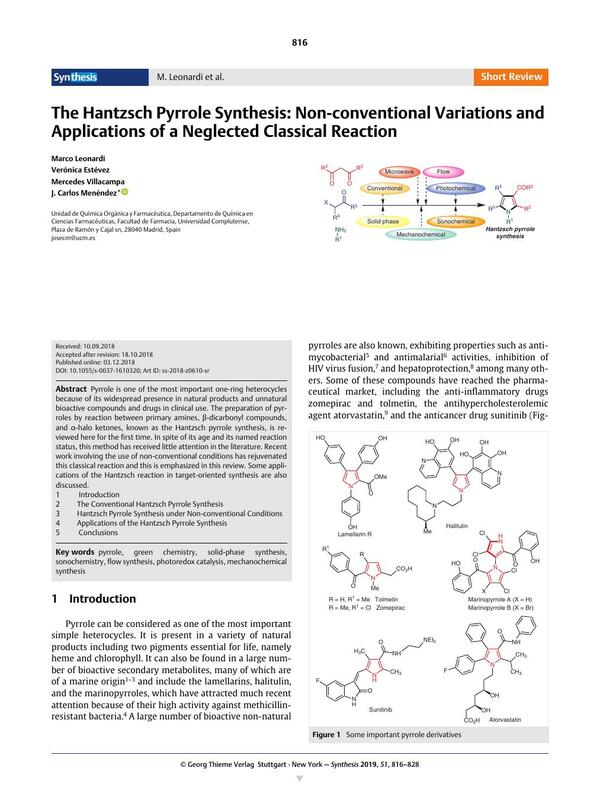 Some applications of the Hantzsch reaction in target-oriented synthesis are also discussed.